Ontos: "They Even Gave Me a Medal"
By Donald E. Westlake (1933-2008). 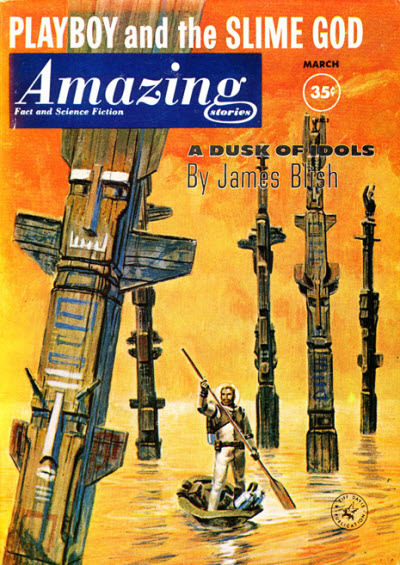 First appearance: Amazing Stories, March 1961. Collected in Tomorrow's Crimes (1989) (for sale HERE). 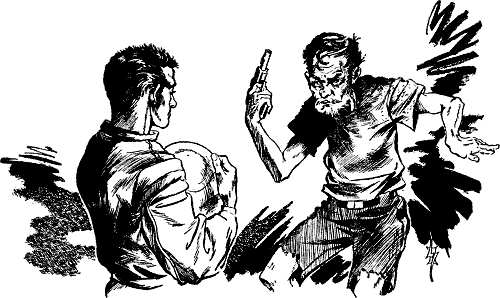 Online at SFFAudio HERE and Project Gutenberg HERE. "The men who did dangerous work had a special kind of insurance policy. But when somebody wanted to collect on that policy, the claims investigator suddenly became a member of ... the risk profession." "I'll tell you how it is. The company isn't accusing you of anything, but it has to be sure everything's on the up and up before it pays out any ten thousand credits. And your partner just happening to fill out that cash-return form just before he died—well, you've got to admit it is a funny kind of coincidence." ". . . the string of coincidences were just too much. McCann just coincidentally happens to die right after he and his partner make their big strike. He happens to write out the cash-return form just before dying. And his body just happens to float away, so nobody can look at it . . ."
"So I just sat, thinking morosely about non-forged cash-return forms, and coincidences, and likely spots to hide a body in the Asteroid Belt." "What do you know about the Risk Profession Retirement Plan?" "I knew right away this meant I was going to have to go off-Earth again. I'm a one-gee boy all the way. Gravity changes get me in the solar plexus. I get g-sick at the drop of an elevator." "The manager—a man named Teaking—went well with the office. His face and hands were spare and lean, but his uniform was immaculate, covered with every curlicue the regulations allowed." "Jafe McCann died just a bit too soon. He was sharp and cheap, but he was honest. If he'd lived, he would have repaid all his debts, I'm sure of it. And if this strike they made is as good as I hear, he would have been able to repay them with no trouble at all." "Not as sharp as McCann when it came to money. That's why all the money stuff in the partnership was handled by McCann. But Karpin was one of the sharpest boys in the business when it came to mineralogy. He knew rocks you and I never heard of, and most times he knew them by sight. Almost all of the Belt boys are college grads—you've got to know what you're looking for out here and what it looks like when you've found it—but Karpin has practically all of them beat. He's sharp." [An asteroid] "Atronics City was about as depressing as a Turkish bath with all the lights on. It stood on a chunk of rock a couple of miles thick, and it looked like nothing more in this world than a welder's practice range." [Being inside an asteroid] "All of these levels have one thing in common. Square corners, painted olive drab. The total effect of the place is suffocating. You feel like you're stuck in the middle of a stack of packing crates." [Walking on an asteroid] "The suitcases weighed about half an ounce each out here, and I felt as though I weighed the same. Every time I raised a foot, I was sure I was about to go sailing into a wall. Local citizens eased by me, their feet occasionally touching the iron pavement as they soared along, and I gave them all dirty looks." 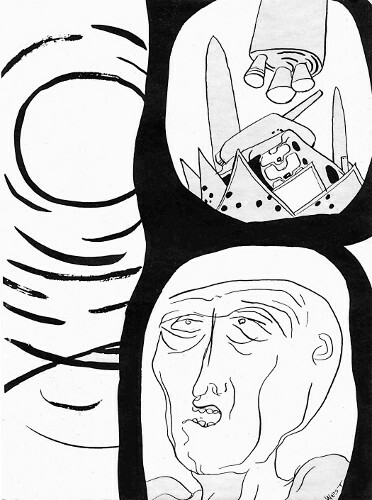 [Sleeping on an asteroid] "Today, my stomach was very unhappy, and my head was on sympathy strike. Today, I was going to spend my time exclusively in bed, trying not to float up to the ceiling." [Asteroid miners] "Close-mouthed, anti-social, fiercely independent, incurably romantic, always convinced that the big strike is just a piece of rock away." . . . "Searching the asteroid chunks for rare and valuable metals is basically pretty lonely work, and it's inevita-ble that the prospectors will every once in a while get hungry for human company and decide to try a team operation. But, at the same time, work like this attracts people who don't get along very well with human company. So the partnerships come and go, and the hatreds flare and are forgotten, and the normal prospecting team lasts an average of three months." "The Spy in the Elevator." 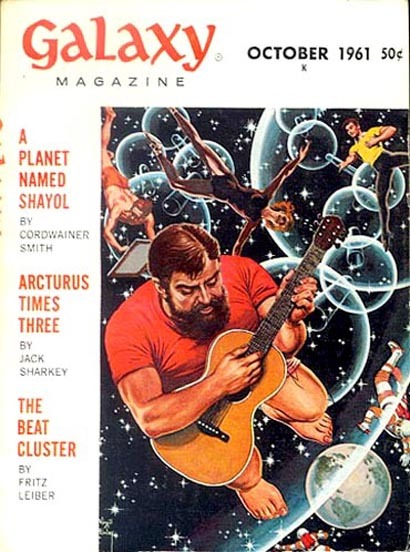 First appearance: Galaxy, October 1961. "He was dangerously insane. He threatened to destroy everything that was noble and decent—including my date with my girl!" The war is over and the world is safe, but only a maniac with a gun wants to believe it . . .
"I was a gymnast instructor. The subjects I taught included wrestling, judo and karati—talents I would prefer to disclose to him in my own fashion, when the time came." "I don't mean that Linda's a perfectionist or a harridan or anything like that. Far from it. But she does have a fixation on that one subject of punctuality." . . . "I remember one time, shortly after we'd started dating, when I arrived at her place five minutes late and found her having hysterics. She thought I'd been killed. She couldn't visualize anything less than that keeping me from arriving at the designated moment. When I told her what actually had happened—I'd broken a shoe lace—she refused to speak to me for four days." "'We're not supposed to give this information out, sir,' she said, her voice low, 'but I'm going to tell you, so you'll understand why we had to do it. I think it's perfectly awful that it had to ruin things for you this way. But the fact of the matter is—' she leaned even closer to the screen— 'there's a spy in the elevator'." "He was rather short, perhaps three inches shorter than me, with a bony high-cheekboned face featuring deepset eyes and a thin-lipped mouth. He wore gray slacks and shirt, with brown slippers on his feet. He looked exactly like a spy ... which is to say that he didn't look like a spy, he looked overpoweringly ordinary. More than anything else, he reminded me of a rather taciturn milkman who used to make deliveries to my parents' apartment." 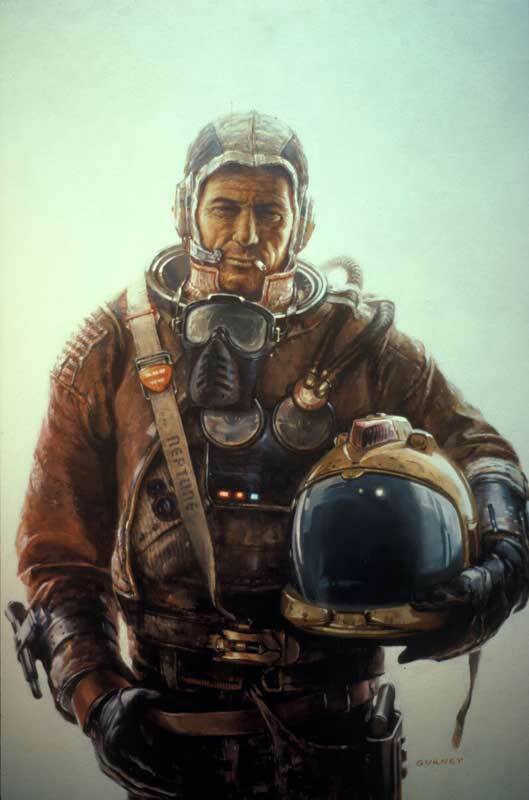 Typo: "caught be spy already"
- In "The Risk Profession" our protagonist travels to an asteroid; for more about the minor planets in fact and fiction, go HERE, HERE, HERE, HERE, HERE, and HERE. Space mining is also thoroughly covered on Winchell Chung's Atomic Rockets megasite HERE, while asteroid prospecting features heavily in one of our previously discussed stories HERE. 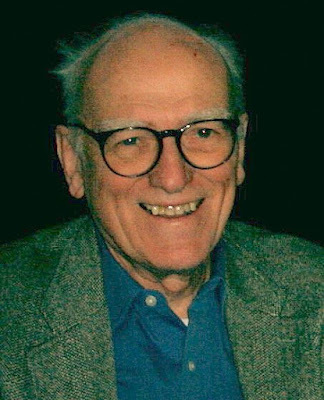 - Before he repudiated his involvement with the genre, Donald Westlake wrote some pretty good science fiction, which was to be expected, so good were his auctorial skills; see these references for more about his output: Wikipedia HERE, the GAD Wiki HERE, the SFE HERE, and the ISFDb HERE. 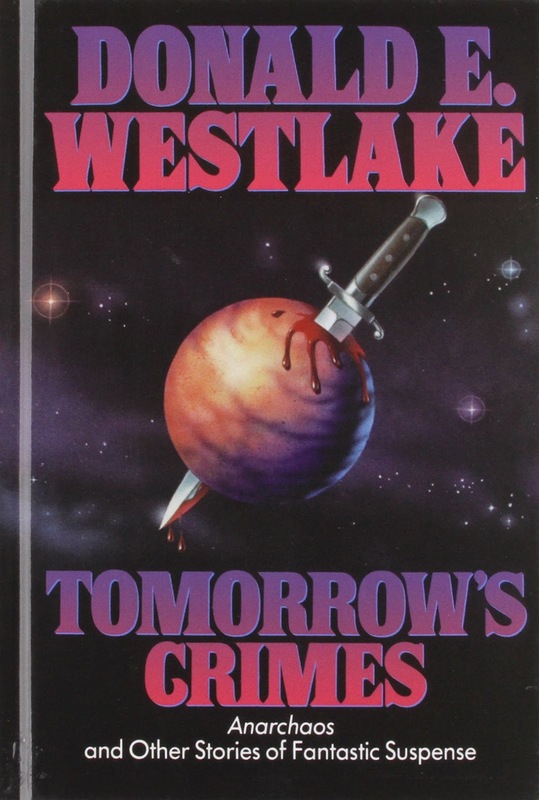 Indeed, it's decidedly not the case that he [Westlake] only wrote science fiction when he was just starting out as a writer, eagerly grasping any opportunity that came his way, irregardless [sic] of genre: he carried on penning SF right up until the late-1980s. Evidently, science fiction was something that continued to fascinate and inspire him, even when he no longer needed to write SF stories – or sleaze paperbacks, or any of the other things he wrote for a paycheck in those early days – just to make ends meet. The bottom line: "I'm almost incapable of lying. I'd be a terrible spy."